Documenting your project as you go. Taking on the seemingly immense task of performing a full ground up restoration of a collector car can seem daunting. Even if it's not a complete restoration that you're contemplating, there are steps you should take that will let you document your project in a way that will be invaluable during research and reassembly. 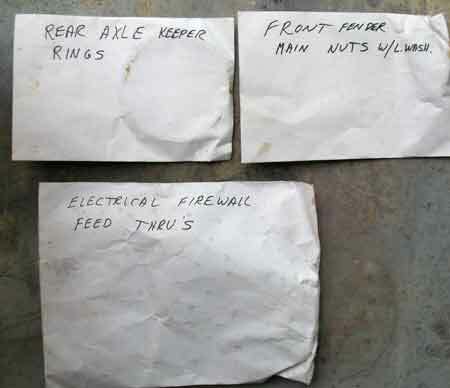 Here are some obvious (and some not so obvious) tips that should help you when documenting your car restoration project. As we're now well into in the global information age, sharing information among collectors is becoming more common place. Whether it's for you or for sharing, taking some simple steps in the early stage of restoration doesn't require significant effort, just some discipline. Months (or years) later it can add to the enjoyment and appreciation of the work you put into your car restoration project if you take the time now to properly document and photograph your efforts. Complete documentation of your project will also serve as a means of verifying the work done in the event that you want to sell your car. During disassembly, you will need to capture the details of how parts are mounted, their appearance and orientation, and even recognizing and documenting missing or broken pieces. This is not to suggest that what you are documenting is original to the car. You're merely documenting what is there. It's not uncommon that over several decades changes could have been made that altered the factory original. But it is important to document these details as they're currently presented for comparison at a later time. We start with a good notebook for creating a diary-like narrative when coupled with images and diagrams gives us the complete story of our car restoration project. Legible handwriting is essential. And with digital cameras and video cams, capturing images has never been easier. Digital Camera — The most obvious way to document details is with a digital camera. Digital cameras offer the ability to take as many pictures as you like with minimal expense. You may find it useful to take several pictures of a particular area: one at a distance, another at intermediate distance, and a close up shot. If you rely solely on closeups, you may lose some context as to what you are looking at. When possible, it's advisable to use ambient lighting for your photos. Using flash sometimes gives you washed-out images that can obscure the details you're trying to record. Sometimes a trouble light is enough to bring up the details you need. When finished, simply delete the photos that don't quite look right or are out of focus. Be sure to download your photos regularly into a dedicated folder on your computer. If you don't have a computer, many drugstores have facilities for printing your digital images and you will have the option to print only those photos you want to keep. The prices of digital cameras, especially the Point and Shoot kind, have fallen enough to allow a dedicated camera for shop use. If you already have a digital camera, this could be an opportunity to upgrade to a newer, more capable model for family use and keep the older model for use in the garage. Then there's no need to worry about getting grease or other dirt on it. The camera doesn't need to be set on the highest quality image and you can keep your camera's battery charger in the shop, too. It's also important to remember to take your digital camera or video cam with you to classic car shows. 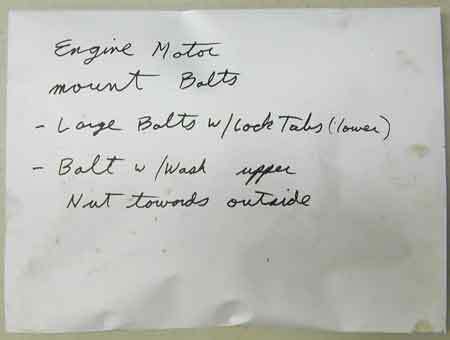 This is invaluable when determining what is and what is not original to your car as well as getting a "second opinion" as to how the car should go back together. Digital Video Camera — Camcorders are helpful as they provide the opportunity for a "photo in the round." You can record a full sampling of an auto, going from bumper to bumper, under the hood, and into the interior. Take your time. Move or pan the camcorder slowly. The intent is to pick up as much information as you can. When it's not rushed, the playback could provide an "Ah ha" moment on a particle detail, maybe one you weren't even focusing on when you took the video. It pays to slow down. Camcorders like digital cameras are more affordable than ever. The depth perception that video offers is immeasurable. A complete video should take 30-45 minutes. Use the zoom feature as necessary; move steadily and slowly and shoot from many points of view: Avoid shaking and if necessary include an external light. The vehicle you record can be restored or an untouched original. If you explain to a car owner what you're trying to accomplish, he or she usually will gladly accommodate your request, but be sure to ask first. And be careful with the camera and any other related equipment you may have. You don't want to ding the paint while trying to get that perfect shot. Camcorders also record audio, so don't be afraid to narrate along the way. Purchase supplies first — Purchase basic supplies and have them readily available in a clean area of the shop. Sharpie marking pens come in different sizes ranging from fine thin tip pens to chisel tip markers. Sharpie permanent markers are worth the extra cost over other markers as their inks don't smear and mark on almost any surface. Clockwise, Sharpie Brand markers, large self adhesive envelopes, medium size 6X9 envelopes, and smaller 2X4 envelopes, older Nikon Coolpix digital camera, painters masking tape, and reinforced I.D. Tags. Bound Notebook Diary — Purchase a bound book either with or without lines for use as your diary. Art or craft supply stores are great sources for these types of books. Avoid loose leaf or spiral books as the paper is thin and pages can easily be torn out. Don't forget to date each entry. You can leave room on the pages for inserting printed photos if you think the detail is important enough or at a minimum, you can reference the picture numbers you saved on your computer. 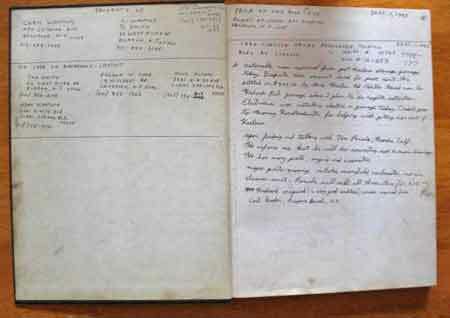 Example of a hardbound book used as a dairy during disassembly. Include vehicle specific information on the first few pages. Remember, this diary is used to tell a story so write down in words and make diagrams of parts and their orientation. You can also write in picture numbers taken from your digital camera that are related to that section. Envelopes — Many different sized envelopes are helpful when trying to keep your project organized. Large envelopes with self adhesive flaps make parts organization easy. Before depositing the parts and sealing it, write on the envelope the contents and any notes such as part orientation or inventory. 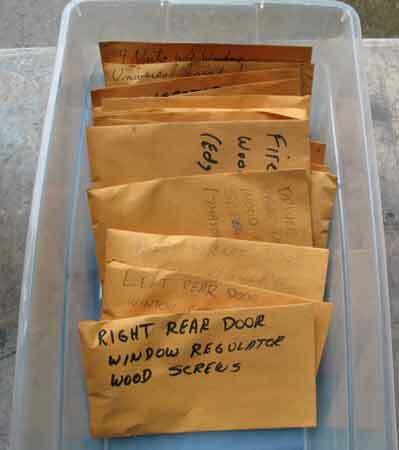 Plan ahead when organizing parts into envelopes. Parts that will require chrome plating should be stored separately from others for easy retrieval. That lessens the chance that you could miss a part when sending them all off to the plating shop. We recommend using envelopes with metal clasps if you think you will need to retrieve a part for fitting or inspection. It's easier to re-use the envelope and you don't have to tear the envelope open. In order to save space, it makes sense to select large envelopes for your large parts and smaller envelopes for the small stuff. Large envelope marked with contents. 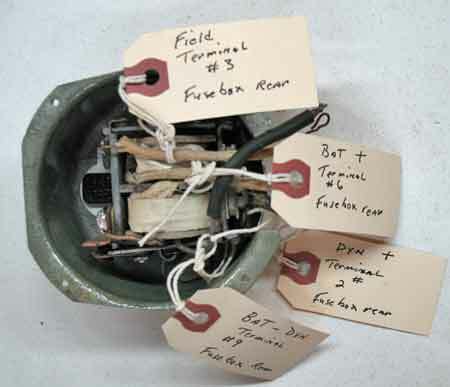 Include things like date taken apart, orientation of the parts, and any relevant information. The writing on these envelopes is good, but what is missing are the picture numbers. Any type of reference can be useful when reassembling your project. 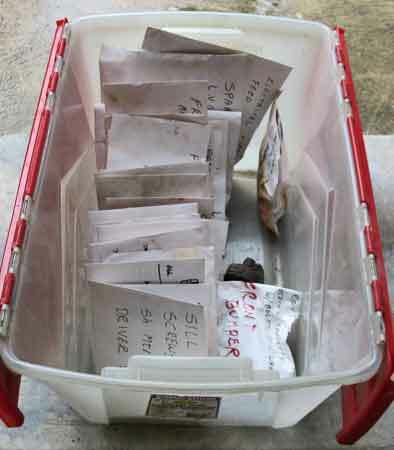 Example of small envelopes for smaller or single parts. The same writing rules should apply. You can use clear or solid color stackable storage bins for storing your parts envelopes. This makes retrieving parts easy. The bins are available at office supply stores, or large home stores like Home Depot or Lowes. 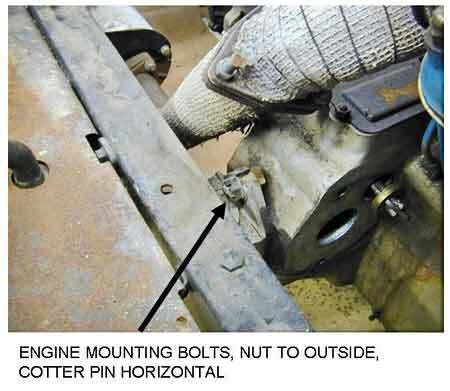 Marking the outside may help when hunting for a part: One for Chassis, one for engine, and perhaps another for interior parts. 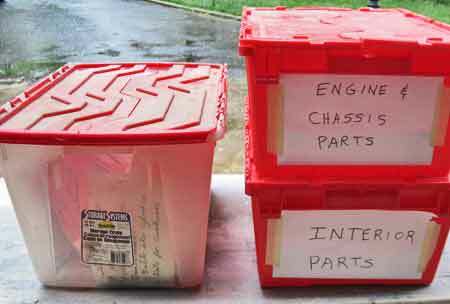 Stackable bins provide good organization for your parts into logical categories. Writing on paper or light cardboard maybe better than writing on the bin itself when planning to reuse the bin. Orienting your parts envelopes much like a filing system helps when looking for a part. 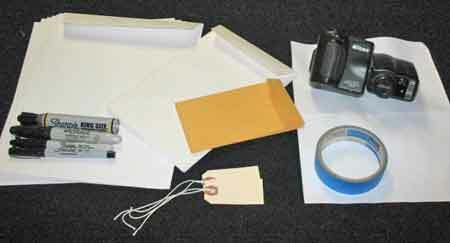 Tags — Reinforced tags with string or wire can be used for those parts too large to fit into an envelope. Avoid the little cheap "price" tags with light thread. A tag that gets ripped off its part is of no value. You can add as many tags as needed and suggest writing on both sides of the tag in case dirt or oil makes one side unreadable. Always PRINT on a tag using a fine tip Sharpee marker. 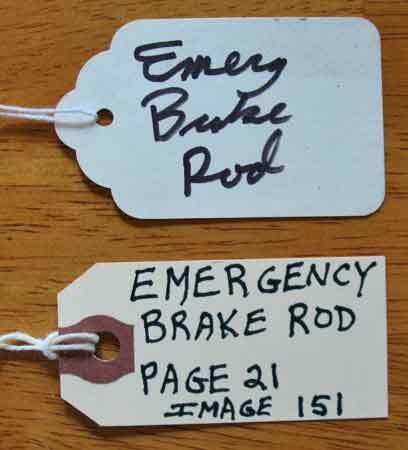 Examples of two types of tags. On top is a frail tag with incomplete information and its thin string is likely to break off the part. Bottom is the preferred tag, a reinforced tag with thick string, and a large area writing area. Establish a numbering or identification convention that can be referred to in other places like a journal or digital photos. Always PRINT on your tags. Another example of using reinforced tags. Could you imagine the headaches in retracing the leads to this 1917 generator cutout if flimsy tags broke off. Home Computer — As with your other areas of interest, your computer can be extremely useful when documenting and organizing your car restoration project. One advantage of using your computer is the ability to view digital pictures at any time. You can zoom in on a particular area of interest without the time or expense of printing an enlargement. You also have the option of printing your image on less expensive paper or a higher quality photographic paper. We like using Microsoft PowerPoint to create our documentation. Normally used for making presentations, Powerpoint allows you to insert a picture into a slide, size it accordingly, add comments or highlight areas with arrows and resave it as a .JPG picture. Employing Powerpoint for your project from the beginning also lets you share your experience with fellow restorers at your classic car club meetings. Example of a standard JPEG digital camera image that has had notes added to it and resaved as a .jpg image using PowerPoint. Spread sheet record keeping — Using a spreadsheet program such as Microsoft's Excel, to record hours and expenses can be valuable. We recommend that you create and print a blank template that allows you to write in the hours or costs as your work through your project. You then can transcribe the data into your spreadsheet at a later time. This should be done on a regular basis such as once a week or monthly. Again, this information will be essential if you should decide to later sell your restored car. Cross Referencing — Establish a naming format that can be used to tie it all together. Most digital cameras save their pictures in a sequential numbering scheme. Reference the relevant digital picture file names on your tags, envelopes, and in your diary. This saves you time when you're working on one particular facet of your project. 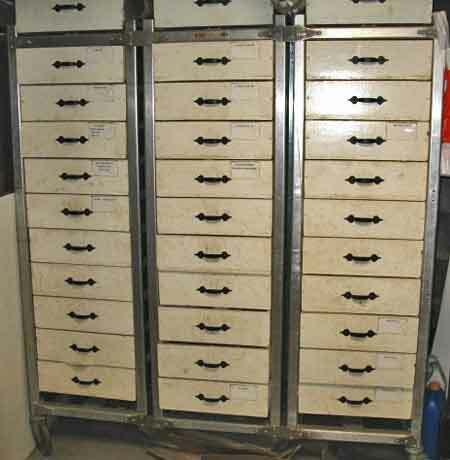 Shelving and other storage — Heavy duty shelves provide a great place to store your car restoration project parts. Avoid commingling your parts with parts from other projects or any non-automotive supplies. Some heavy duty "wire" type shelving units come with adjustable shelves and roller casters which makes it easier to move around the shop. A discarded aluminum baker's cooling rack was just the ticket for making a storage unit for small parts. A weekend project made the 30 individual drawers using 1/4 inch Luan plywood. This discarded aluminum bakers cooling rack works well as a multi drawer storage unit. Thin 1/4 inch plywood was used to make the thirty drawers. Three large bins are on top for large parts. Also, economical storage bins are the sliding baskets from IKEA. 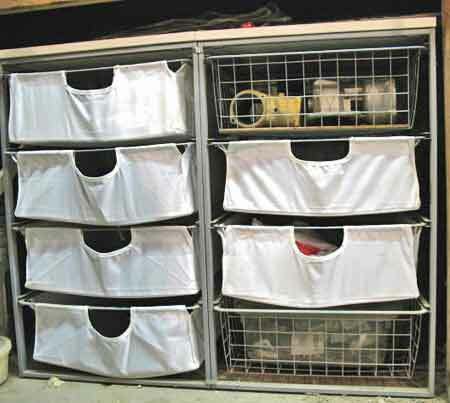 The wire or cloth baskets are available in four or six drawer units and can be stacked. Open wire versions make looking for parts easy while the cloth or solid plastic ones keep small parts from getting lost. These rack baskets from IKEA come in open wire, cloth covered, and solid plastic versions for about $22 for a set of four. They can be stacked where room permits or under the bench for easy access for commodities like disposable gloves or occasionally used tools like multi meters or air tools. Relying on your memory on how your collectible was assembled is a recipe for disaster. Take many pictures of specific areas from different angles. You can always refer to them later. Take pictures of fellow collectors' vehicles and compare them to your project. Don't take for granted that a finished project is correct. Use your best judgment, and if needed, do a little research. Don't be afraid to ask a fellow collector to take pictures of a vehicle that is not accessible to you. Example: The author in NJ was advised of the same model Packard being offered at a Barrett-Jackson Auction and a collector in Scottsdale, AZ readily agreed to photograph and send digital pictures. And be sure to return the favor if you're asked. Record a chronological diary of your restoration. When required, include descriptions that indicate how parts are related to others. No one is grading you on your narrative, so use whatever descriptions make the most sense to you. Use a separate pocket notebook or section of your diary to record a "parts or materials needed" list. It is indispensible when attending Flea Markets. "Now what size hose clamps did I need?" Save your digital pictures to your hard drive and periodically save all your restoration documentation to a CD, DVD or Flash Drive. The three most important rules when working on your computer are: 1. Back it up; 2. Back it up, and 3. Back it up. A hard drive failure can cause your archive to disappear in a nanosecond and all your efforts would be for nothing. Also be sure to save additional copies if you might want to share with fellow collectors.